Our Favorite 5 singles & blends collection contains some of our best-selling 100% therapeutic grade essential oils (no carrier oils added) in a stylish padded case which protects the vials, while mesh sleeves keep them securely in place and allow easy identification (each bottle is also conveniently labeled on top). Also included in this kit is a very handy oil usage reference card which fits inside the case so you can get the most out of your oils! This kit includes 5-single oils & 5 blends. The case keeps your oils organized and tidy for everyday use, and is also perfect for extended travel trips, and emergencies. 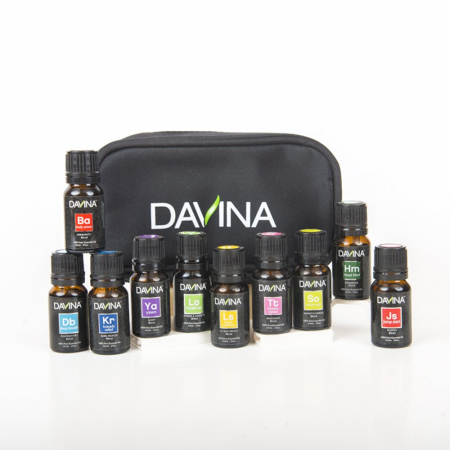 This essentials kit also makes a great gift for that essential oil lover in you life. Lemon: Mildly phototoxic. Recommended dermal use is 2.0%. If applied to the skin at over maximum use, skin must not be exposed to sunlight or sunbed rays for 12-24 hours. Can store in the refrigerator in an airtight container to avoid oxidization of oil. Avoid eyes, and undiluted use on mucous membranes & sensitive skin. Peppermint, Oregano, Immunity blend, Respiratory blend: Dilute oil for topical and internal application. Sore Muscle blend: Do not use on children under 2 yrs old. See GC/MS reports on specific oils’ product page. We use the 2 major brands and have ventured to try others and these are a good "fall back" when you need an oil without breaking the bank. Loving this wonderful selection of oils in a easy carry kit. I've used Essential Oils for quite a while and have been pleased with the quality and scent of what I've tried so far from Davina. This is such a great collection of essential oils. I've found Davina's essential oils to have the proper scents and not feel greasy or oily when rubbed between your fingers. The bottles are nice and the Euro droppers work great. The case is nice and sturdy and the oil are protected inside of it having their own pockets. This is my new go-to oil kit to take when traveling because everything is together and safe and the oils are ones that I use on a regular basis. I couldn't be more happy with this collection and the case. I highly recommend it. When I saw this set I knew that I wanted it. It includes five pure oils that I use a lot. Then you get five blended that are super useful for my everyday life. I use my essential oils so much,especially in my diffuser ,when I buy oils,the more the merrier. Remember to mix your blends with carrier oil to avoid allergic reactions. I use the blends for topical use mainly. For instance if you use the Tummy Tamer blend in a diffuser, it's not really going to soak into your tummy to do the healing magic it provides. Yet the stress ones may work well used either way diffuser or on your skin. The muscle pain one, again won't help unless you massage it into your skin over the effected area. I just love the cool logo zipper bag that is included with this set. It contains a slot to fit in each of these to keep them conveniently and safely in place. You can use it to hold your other oils for travel as well. I recommend this set. It is very impressive. I can not say enough good things about these essential oils. These are just as good if not better than the you know young ones which I have; and these have all passed the white paper test with flying colors. I have had no issues what so ever with using these with a carrier oil on my skin and using them in my aromatherapy diffuser have been just fantastic. I do not get any headaches at all which tells me there is no fillers or poisons in these oils, which some others do. I took a chance on these oils as they had no reviews at the time I purchased them. I am so happy & proud with my purchases. Yes, purchases!! I have ordered so many of these, that's how impressed I am with the extremely high quality of these essential oils. They’re 100% Clean & Pure! What a wonderful starter kit for beginners! It has a nice mix of staple essential oils along with a nice variety of specialty mixed blends. I love the carry case, it's very well made. The zipper is sewed in nice, the compartments inside are roomy and feel very sturdy. The essential oils are all quality oils. Very, very happy to have come across this essential oils line. Really solid collection of high quality oils. 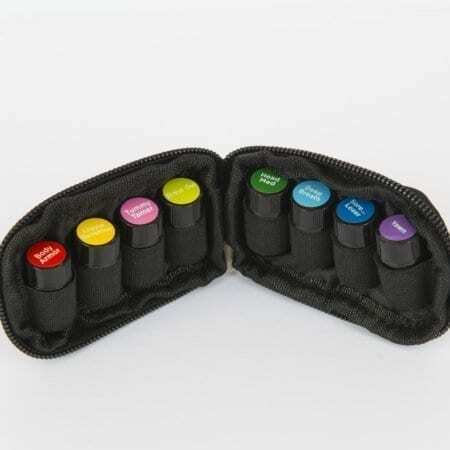 This differs from all the other collections because it comes with a great carrying case that keeps the oils in place and has 5 singles and 5 blends. I really love Davina's keychain kits, so I was excited to get bigger bottles with this kit My favorite smell is definately the Liquid Sunshine. It smells divine and lifts my mood. Good mix of citrus oils with a touch of vanilla. Makes me want to eat it. This is great to diffus. My wife uses Deep Breath all the time when her allergies flare up. Makes her eyes stop itches and stops her nose running. Takes about 10-20 minutes to work. The lavender smells better than the doTERRA and Young Living that I have. It's great for getting me off to sleep I like the peppermint for getting ride of my frequent headaches. They do sell Head Med which is even more effective. The lemon is really great smelling Italian citrus. It's very effective for cleaning and lifting my mood. Davina's Frankincense is really nice. I think it's better than almost every other one I've used. My whole family loves how useful the Tummy Tamer is. Cures nausea, IBS, and general upset. I really appeciate that they include the latin names, the country of origin and they post all of the GC/MS reports on their website. I feel like they aren't trying to hide anything like so many other companies. Customer service is also helpful as well. Very impressed with Davina Wellness! I'm a long time Young Living client and distributor based on the quality of Young Living and their blends. I was in a pinch and have been on a tight budget lately so I decided to try Davina Wellness oils. The quality is exceptional and the blends are very similar to what I use with YL! Definitely recommend!! !